E-bike shops in Jiefang Road have launched promotional activities to lure customers. The e-bike market in Sanya is seeing a sales boost as the local government has recently announced regulations limiting the use of motorbikes and encouraging the registration of e-bikes. 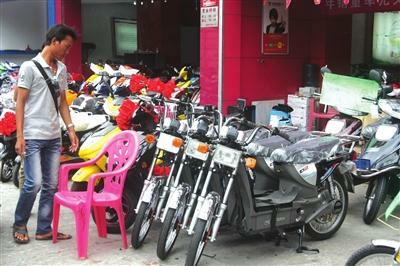 Many e-bike shops around the city have launched promotional activities to lure customers. Some stores have replaced electric bikes with qualified vehicles based on the national standards as these e-bikes will need to get registered for a better management. E-bikes with a maximum speed of between 20 and 50 km per hour will be categorized as conventional motor vehicles. According to the regulations, motorcycles will be restricted in 4 areas of Fenghuang Road, Dadonghai, Sanya Bay, Railway Station and road sections of Sanya Bay Road, Yingbin Road, and Yuya Avenue.